DR Volunteers shine light of Christ in flood-ravaged W.Va.
Florida disaster relief volunteers clean a flood-damaged home in Elkview, W. Va. The elderly woman was still grieving the death of her husband when torrential rains June 23 flooded her West Virginia home. Consumed by her own sorrow and resentment, she was unable to respond to the devastation within her own house. When Florida Baptist disaster relief volunteers arrived there a week after the historic flood, the widow appeared distrustful and bitter, volunteers reported. But as the team pulled out muddy carpet and unsalvageable furniture, disinfected contents and cut away moldy sheetrock, they sparked conversations with the homeowner and her sister, letting the women know they cared. On the second day of the cleanup efforts, the volunteers sensed a new hope growing within the women and even shared moments of laughter. Upon their departure, the widow allowed the volunteers to pray for her. It was as if darkness had turned to light, they said. 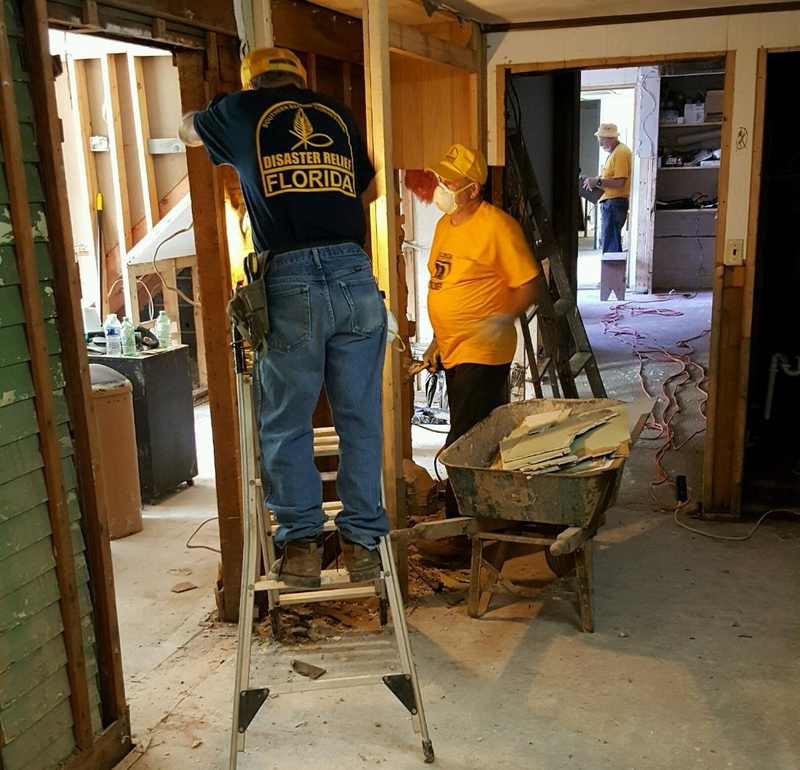 Florida Baptists are working to shine the light of Christ as they respond to the needs of families in flood-ravaged West Virginia, said Delton Beall, director of the Florida Baptist Disaster Relief and Recovery, who has been on site since June 29. The heavy rains caused historic flooding that claimed at least 24 lives and destroyed or severely damaged thousands of homes. State and federal officials have declared portions of the state disaster areas. Upon their arrival in West Virginia, Florida Baptists assessed damage from the flooding working in partnership with the West Virginia Convention of Southern Baptists and Baptist disaster relief organizations from other states. Stationed in Charleston, Florida Baptist crews were assigned clean-up and recovery duties in Elkview and Clendening, towns located along the Elk River to the east of the state capitol. At least 114 homes have been identified in these communities in need of help with little resources. Within days, the 63 Florida volunteers serving there began their cleanup responsibilities, assisting 56 families by July 9. “Everywhere you look there is mud,” said volunteer Dusty Gregory of Jacksonville. “It’s so deep in some parts the roads are impassable.” He spent a morning helping a family that lived on the banks of the Elk River in Elkview. When the authorities opened the damn to manage the flooding, the water rose above its banks, surpassing the chain-linked fence surrounding their house, pouring a wall of at least four feet of water and mud into their home. But they are resilient in this rural community, he added, neighbors are helping each other recover. One of the biggest threats to homeowners after a flood is the dangerous mold that starts growing in the home. The Florida volunteers travel with “mud-out” trailers loaded with pressure washers, disinfectant, buckets, shovels and other equipment needed to treat a home after it has been flooded. Mud, silt, damaged belongings and other debris must be removed along with any sheet rock damaged by the flooding. The process could not start until flood waters recede and the drying-out process has begun. The volunteers sleep in churches, on gymnasium floors and in Sunday school classrooms. They eat in a mass feeding unit provided by Southern Baptists of Virginia. When Beall was headed to West Virginia, he detoured by Kentucky to pick up a new shower unit—a massive trailer retrofitted with plumbing and multiple stalls—built with Florida Baptists’ donations to the Maguire State Mission Offering. The new shower unit was located in the center of town in hard-hit Clendenin, where it provided hot, clean showers to more than 200 people in the community. The unit also provides laundry services for volunteers. “The showers have proved to be such a needed ministry here,” said Beall. Florida’s response will end July 16, said Beall. Volunteers will return to the state at that time. To donate to the Florida Baptist DR relief effort send a check to the Florida Baptist Convention, 6850 Belfort Oaks Place, Jacksonville, FL 32216. Designate “West Virginia disaster relief.” To make a donation by credit card, call 800-226-8584, att. Mike Gilley, ext. 3047 or Flor Ramirez, ext. 3100.